April 26, 2009, the Palais Galliéra, Museum of Fashion, closed for renovation. The City of Paris sunk 5€ million ($6.5 M at that time) into safety and upgrading the equipment, including an handicapped entrance. 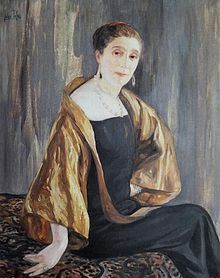 Jeanne Lanvin was born into a poor family in 1867, the first of eleven children. Which meant, at that time, that you had to contribute to the family finances. At an early age. Especially girls. By 1880, she was already an apprentice milliner, and only 13 years old. By 1885, she had her own millinery shop. And by 1908 she had expanded her fashion activities to robes, first for women, then for children and eventually the summum: wedding dresses. All are present in this exhibit of over 90 of her creations. What strikes you first in these dresses is their timeless quality. Yes, obviously some details are dated, but overall many of these dresses could be worn today and not look out of place. Lanvin was known for several things. One was color... or the lack of... or the sublimation of. She started out with black and white, later adding gold. The two colors she highlighted were what became known as Lanvin blue and also absinthe green, a slight, greyish green like the “green fairy” of the fabled drink. She was also known for topstitching, which often replaced the use of opposing colors to create a pattern. 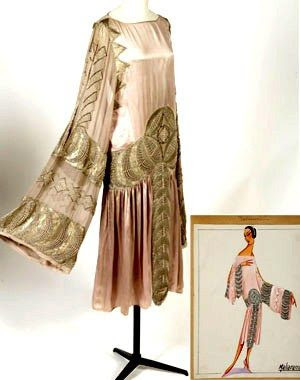 And appliqué, lots and lots of appliqué, plus tiny little beads, all sewn on by hand, which, along with plissé (tiny pleats) probably ruined many a seamstress’s eyes. Boleros were also a trademark of the House of Lanvin, as was the bouffant skirt. And motifs - often geometrical, sometimes exotic in theme, with an accent on the Japanese look - were often off-set and diagonal. You could recognize a Lanvin dress in the blink of an eye. At its busiest, Maison Lanvin employed almost 1,000 petites mains, little hands, meaning seamstresses, usually specializing in one thing, such as beadwork or plissé. Lanvin put out more than 100 different models each year. And to make sure the colors were the colors she wanted, Jeanne Lanvin had her own dyeworks in Nanterre, a suburb of Paris. Madame, as she was called, was very “hands on”, from start to finish. And it did well for her; Maison Lanvin is the oldest fashion house still in existence. Half of the dresses and coats on exhibit here are laid out flat and reflected vertically in a mirror. Others are worn by dressmaker dummies and also reflected in mirrors so you can see both front and rear at the same time. Galliéra isn't a big museum. There are basically two large rooms and another narrow room on either side. 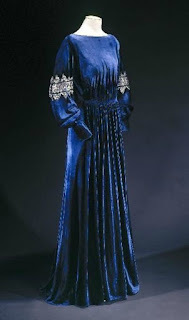 But until the end of August, it will be filled with the discretion and elegance of Jeanne Lanvin. * I didn't post this entry "in the day". Other things intervened. But as Jeanne Lanvin was one of the landmarks of French fashion, I decided to post it now, even though the show is long over. buy passport, driver's license, diploma ID card and other. Private, serious and efficient work. know that we are at your service.